The play "Gosho Zakura Horikawa no Youchi" was originally written for the puppet theater (Bunraku) and staged for the first time in the 1st lunar month of 1737 in Ôsaka at the Takemotoza. It was adapted for Kabuki many years later and staged for the first time in the 4th lunar month of 1762 in Ôsaka at the Naka no Shibai [casting]; the roles of Benkei, Owasa, Shinobu and Jijû Tarô were played by Nakamura Utaemon I, Arashi Koroku I, Arashi Hinasuke I and Fujikawa Hachizô I. "Gosho Zakura Horikawa no Youchi" is a 5-act maruhonmono. The "Benkei Jôshi" scene belongs to the fourth act. --> Other still performed act: "Tôyata Monogatari". Yoritomo of the Genji clan has defeated the Heike clan and has become the ruler in Kamakura. His younger brother Yoshitsune is also an able combat commander, but Yoritomo, who is a suspicious warlod, distrusts Yoshitsune. Yoshitsune's wife Kyô-no-Kimi is a daughter of Taira no Tokitada, who is one of the main members of the Heike clan. Kajiwara Kagetoki, a senior retainer of Yoritomo, has suspected that Yoshitsune might rebel with Tokitada against Yoritomo. Yoritomo has ordered Benkei to bring her severed head as an evidence that Yoshitsune is innocent. Benkei goes as Yoritomo's messenger to Jijû Tarô's mansion, where Kyô-no-Kimi, who is pregnant, lives. Jijû Tarô and his wife Hananoi listen to Benkei's official message. Even if it may help proving the innocence of Yoshitsune, Jijû Tarô can't accept it because Kyô-no-Kimi is the wife of his lord. Both Jijû Tarô and Benkei come to the conclusion that they have to look for a substitute of Kyô-no-Kimi. Jijû Tarô, hananoi and Benkei retire in a different room while one of Kyô-no-Kimi's ladies-in-waiting, Shinobu, stays alone on the stage. Her mother Osawa comes to the mansion to meet her. When the mother and her daughter are enjoying their reunion, Jijû Tarô and Hananoi come back to the stage. 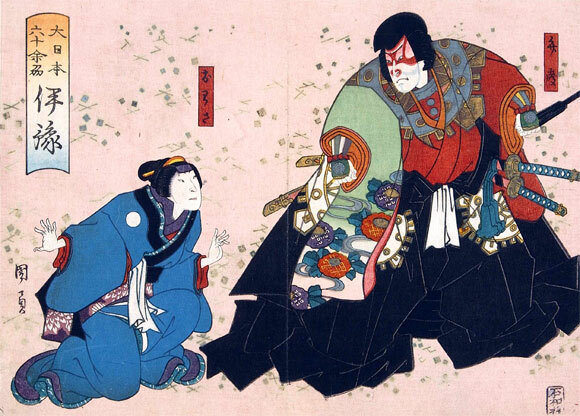 Jijû asks Osawa to give him Shinbu's life instead of the life of Kyô-no-Kimi. Of course Shinobu is surprised very much, but she accepts it, because she is a retainer of Kyô-no-Kimi. Osawa is surprised very much, and refuses his request. She has a husband who is Shinobu's father, but she doesn't know even his face and name. Osawa says that she can't kill her daughter Shinobu until Shinobu meet to her father. Jijû Tarô gets angry with her very much, because he thinks it is her bad excuse. Then, Osawa talks about her life. 18 years ago, when Osawa was waiting for the moon to rise, she and someone made love in the dark. Her lover fled hurriedly, because some people came near them. He left only his red left sleeve to her. After that, she found that she was pregnant, and the baby was named Shinobu. Osawa has been searching for her lover for 18 years. Osawa shows the red left sleeve wearing under her kimono to them. Jijû Tarô understands Osawa's talking, but he can't give up killing Shinobu. He tries to slash Shinobu with his sword. Although Osawa protects her daughter, Shinobu is cornered to the front of the paper door (fusuma). Shinobu is suddenly stabbed through the fusuma and her murderer is Benkei. Benkei appears on stage, hodling a bloody sword. He shows his red right sleeve wearing under his kimono. It and the red left sleeve that Osawa has make a pair. After he lost its red left sleeve, he always has been wearing it like before, because it was sewed by his mother. Benkei was Osawa's lover of that night. Osawa tries to make Shinobu know that Benkei is her father her daughter has already become unconscious. She dies without realizing that she was killed by her real father. Benkei says that if he had met Shinobu as father and daughter, he couldn't have killed her. He cries the first time in all his life. Jijû Tarô severs Shinobu's head. Then, he commits suicide by seppuku. All of them are surprised, and Hananoi asks why her husband should die. Jijû Tarô answers that Kajiwara Kagetoki is a suspicious man, and that he will suspect the severed head isn't Kyô-no-Kimi's one. If he dies, Kajiwara may believe that Kyô-no-Kimi has really been killed and that Jijû Tarô killed himself to atone for the killing of his lord's wife. Before dying, the old man asks Benkei to bring him head to Kajiwara as well as Shinobu's one. The old man dies and Benkei severs his head. The two grieving women try to cling to Benkei but he throws them off and leaves the mansion through the hanamichi, carrying the two severed heads with him. The monk warrior has successfully accomplished his terrible mission.